The primary religion of the people of Bhutan is Buddhism, which is followed by almost 75% of the population and the remaining follow the Hindu way of life. Religion binds the people of this state, where all aspects of life, be it cultural, social, ethical, all stem from it. Their beliefs, their governance (though non democratic), and their way of life shows so, and they are very proud to keep their prithee spirit alive. 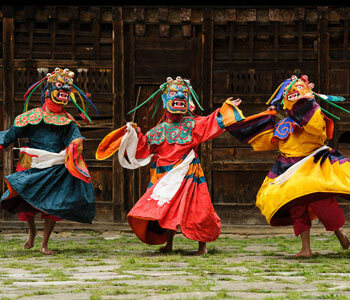 The people of Bhutan celebrate annual festivals of tsechus and dromches with Great Spirit and enthusiasm. These religious celebrations are a delight to see in each district. The stupas and chortens are omnipresent with prayer flags as signs of their existence. Each stupa indicates guru Rinpoche or another high lama may have stopped to meditate. Prayers hold a special significance in daily life of Bhutanese as one special room is dedicated for prayers, called a chosum in every home. Bhutanese believe in maintaining a constant communication with the heavens. They truly and boldly also believe in keeping their country isolated from the rest of the world. A little open minded though now, their belief is still the same, which reflects on the people of being self-contained. Bhutan was also famously known as mountain fortress of the Gods. It was never invaded or colonized by the British, even though they had claimed it in their territory for a belief period. A major part of the Bhutanese population lives in small villages. Their diet is rich meat, dairy, grain and vegetables. The national dish is called Ema datshi, which is made of cottage cheese, chilli and herbs. The meat that they eat is mainly pork, beef and yak. Chang, their local beer, and Aira, a spirit is native and very popular and truly loved. The official language of Bhutan is Dzongkha with various dialects prevalent. In spite of it being primitive in a lot of ways (according to the rest of the world), its thinking and its ways are, very modern. The philosophy of Bhutan is based on no class system; everyone is treated equal in the country. Even women are given equal rights. To keep their tradition and culture alive they believe in dressing in their traditional alive which are long, colourful robes with a belt, which are called Gho for men, and kira for women, adorned with necklaces of corals, pearls etc. Drukpa is native group of people who forms majority of population in Bhutan. They have three ethnic groups namely Sharchops, Ngalops and Lhotshampas. The origin of sharchops can be traced to the tribes of Burma and North East India. 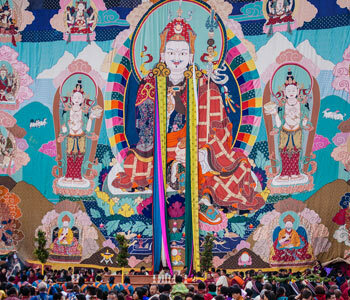 The Ngalops are from the Tibetan plains, which are considered the importers of Buddhism to the kingdom. Most of the Lhotshampas are from Nepalese origin.